A life considered indispensable . . . According to PTI reports, Lt.Ummer Fayaz had come home on vacation where he was attending the marriage of his cousin in Kashmir when he was abducted from the venue of the wedding itself. His body was later found near a bus stand in Harmain village on May 10 morning. Candlelight tribute to Lt. Ummer Fayaz was held at India Gate in New Delhi on Saturday 13th May 2017. The candlelit march was joined by hundreds of persons and went around the India Gate circle. It was a fitting tribute indeed. 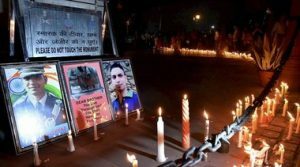 It is heartening that people in metropolitan cities came together spontaneously and expressed their concern at a young army officer’s life being cruelly put an end to. Very dispensable lives of Adivasis . . .
As per Sabrangindia post, on 13th June 2016 the Sukma police announced a successful encounter where a woman Maoist, Madkam Hidme, was killed in an encounter close to village Gompad, Konta Tehsil, Sukma district. Villagers called up Soni Sori and her lawyers yesterday complaining that the ‘official’ account was incorrect and that Madkam Hidme was not a Naxalite, but a villager, picked up from her home, gang raped by the police and then killed. In October 2009, 16 Adivasis at Gompad village in Bastar Dt were massacred by the CoBRA battalion of CRPF. The dead persons included some senior citizens, as well as the mother of one-and-a-half-year-old child..One Adivasi woman Madkam Hidme had filed a petition before the Supreme Cour demanding an investigation into the massacre. The police was on the look out for this Madkam Hidme. In June 2016, the police entered Gompad village and took away a namesake Madkam Hidme, tortured her in police station, raped her, killed her and inserted her dead body into a brand new maoist uniform and claimed she was a maoist guerilla and that she was killed in an encounter.Activist Soni Sori has taken up this case and has managed to file a court case. This is just one example among scores of such killings of Adivasis. Serious Questions that emerge. . .
• How come the death of an urban middle class person evokes such heart-warming response and the deaths of so many innocent Adivasis are quietly ignored? • How to understand an ample compensation is reached to the family of police/army personnel whereas the poor Adivasi families who lose their dear ones and are in dire need of economic help are so easily ignored and forgotten? • Why are the poor Adivasis abused and threatened by the police when they go to file an FIR and have to go back with wounded hearts? • So many innocent Adivasis have been killed in fake encounters but not a single police/army officer has been punished for his crime. Are they outside the purview of law? • Hundreds of innocent young Adivasis are being arrested and labelled ‘extremists / Naxals / Maoists and made to languish in jail for years. Their trial process is deliberately delayed because if they are tried most of them are sure to be acquitted. Can there be a greater injustice? • Every day when we open the morning newspapers or switch on the TV we see one or two or more young people have been arrested alleged to be Naxals or supporters of Naxals. In the heart of our hearts we all know it is false. Yet we prefer not to notice them and carry on with our daily life unperturbed. Have we all not become immune to the injustices perpetrated in our society? • Sadly, most print & electronic media have either been bought off by corporate houses or have consciously aligned themselves to communal forces. Is that not a danger signal to democracy? Questions, questions, all seeking an answer!